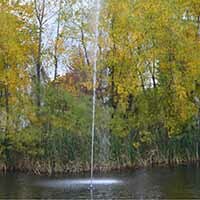 Add beauty and promote health and vitality in your water with the Vitaflume® Decorative Display Fountain. 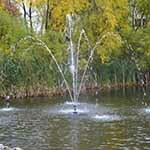 It is the perfect 1 HP fountain for ponds or lakes. Matching beauty with function and price, you will receive two spray patterns, the Imperial and the Geyser . 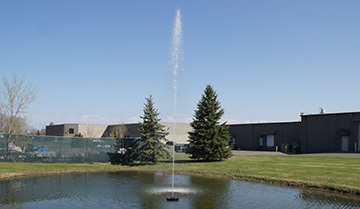 Our Vitaflume® Decorative Fountains are shipped to you direct from the manufacturer. They have a stainless steel pump housing and filter and has an impeller for high pressure water projection. 115 V, 60 Hz: 18' HT. x 36' DIA. 115 V, 60 Hz; 30' HT. x 6' DIA. 9.6 amps (x watt); Single-Phase (115 V) 60 Hz.